Property Size 1,822 sq. ft. This beautifully decorated bay front condo sleeps 6 and is well equipped. Unit has a full kitchen that is well equipped and an outdoor BBQ on the patio. Don't feel like cooking? Walk next door to one of two different restaurants and grab some sushi, a pizza, and a bushwacker. The zero entry pool has a huge pool deck with plenty of room for lounging, catching some rays, or reading a good book. 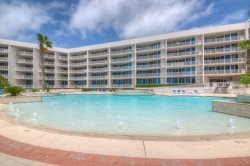 Enjoy the heated (during the winter) wading pool, or take a dip in the hot tub to relax. Have a boat or waverunners? There is first come parking at The Moorings. Trailer parking is not allowed on site, but we can suggest alternative parking during your stay. Emily was amazing. She was so responsive and friendly. She was a true asset. Highly recommend this property. Everything was amazing from the condo to the property and the view was breathtaking. The stay was relaxing all in all private and the kids really enjoyed it. When compared to other places this particular place the Moorings was very peaceful and quiet.